Samsung QE49Q6FN: Is this discounted QLED TV worth buying? | What Hi-Fi? Samsung QE49Q6FN: Is this discounted QLED TV worth buying? Does a £400 discount make this QLED a bargain? Black Friday is now nothing more than a hazy memory, but some of the discounts have stuck around and are still available this Christmas. Which brings us on to the Samsung QE49Q6FN. 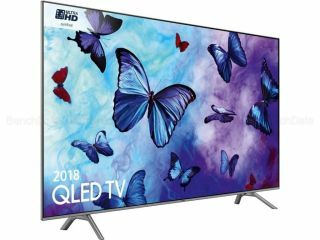 Already the smallest and most affordable model in the company's QLED range, this Q6 TV is currently available with a £400 discount. But is it the bargain it initially appears? The short answer: OLED TVs don't go down to 49-inch and this is the only QLED available at this size, making it one of the most premium sub-55in TVs you can currently buy. That said, not all QLEDs are equal, and the Q6FN does miss out on some of the more advanced features of its siblings. It lacks the direct full array backlight of the top-of-the-range Q9FN, instead opting for a less bright, less controlled edge backlight. But the HDR 1000 rating that Samsung has given it suggests it's got a peak brightness of around 1000 nits, which is more than enough to deliver a bright and punchy picture. The Q6FN also misses out on the One Connect box of other QLEDs, so the cable connections are built into the rear of the set rather than a neat, separate box, which is a bit of a shame. But many of the features of its bigger brothers are here, from the excellent, wand-like One Remote, support for 4K with HDR10, HDR10+ and HLG, an excellent operating system with every streaming service you'll likely need and, of course, the colour-enhancing quantum dots that give QLEDs their edge. Although we've not reviewed this specific model, it's got a lot in common with last year's Q7FN, which we liked a lot. The rival Sony KD-49XF9005 is more of a known quantity, though (we recently gave it an Award), and is currently available for just a little more. The Q6FN is the entry-level model in Samsung's 2018 QLED range, which also includes the Q7FN, Q8FN, Q8DN and Q9FN. It's also the only variant available in any size below 55-inch. Seeing as the smallest OLEDs are also 55in, that makes the QE49Q6FN one of the most premium 49in TVs currently available. Core to the QLED range are quantum dots - tiny semiconductor particles capable of producing far superior colours to LCD and, arguably, slightly superior colours to OLED. The long and short of it is that every QLED we've ever seen has been fabulously vibrant in the recreation of colours, and we've no reason to think the Q6FN will be any different. Unlike the far pricier Q9FN and Q8DN, the Q6FN uses an edge LED backlight to shine light through its quantum dots. That's a shame, but Samsung's got a long history of producing edge backlights that go very bright but stay relatively bloom-free. That said, it's also got a history of producing TVs with relatively poor viewing angles - definitely something to consider if you regularly have lots of people watching your TV from all corners of the room. The Q6FN has the same operating system as the rest of the QLED range, and it's great. Neat, colourful, responsive and customisable, it also boasts all of the smart apps you're likely to need, in full 4K and HDR where available, and even gets Samsung's Ambient mode, which allows the TV to blend into the wall around it when not in normal use. The stripped-back remote is a delight to use, too. Gamers will appreciate the brightness and colours of the screen, plus the super-low input lag. And while it's a shame that the Q6FN lacks the neat One Connect box of other QLEDs, having to plug external devices into the rear of the telly is perfectly normal for most brands. Which connections does it have? Four HDMI inputs, two USBs, an optical output, and aerial and satellite sockets. VERDICT: Having not reviewed the QE49Q6FN specifically we can't say for sure how good it is, but we expect its performance to be roughly similar to the QE49Q7 of last year - a TV we liked a lot. That said, our current favourite 49in TV, the Sony KD-49XF9005, is available for just £50 more than the discounted QE49Q6FN, and we think it's probably worth spending that extra to get a certified cracker. Take you pick from the links below.